In Unity, are there any pre-defined shortcuts, e.g. to open the dash or unhide the launcher? 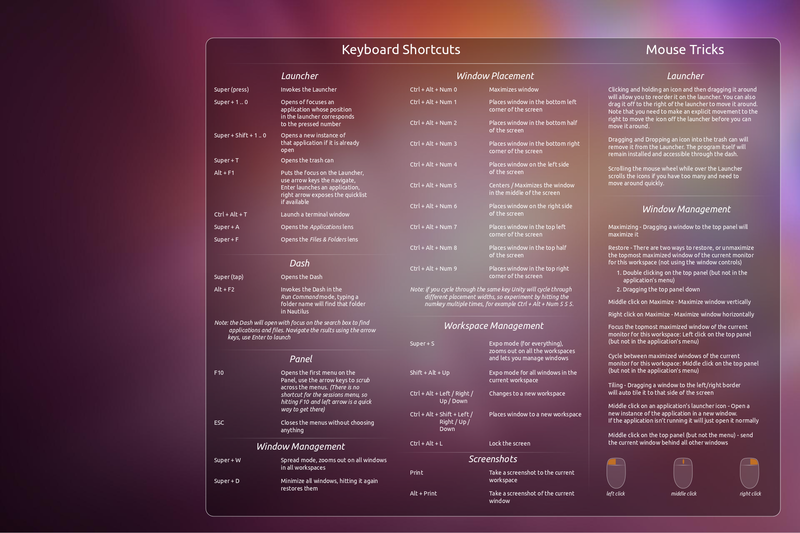 This page will document the keyboard shortcuts and mouse tricks for Unity. Please feel free to add more! What are the meta, super, and hyper keys? Holding down the Super key will get you a keyboard overlay that documents most of these. Hold Super, then press 1 or 2 or 3 and so on until 0 to open or focus an application. The number corresponds to the location of the icon on the launcher from top to bottom. Adding Shift will open a new instance of the application if it's already open. Super + T - Open the rubbish bin/trash can. 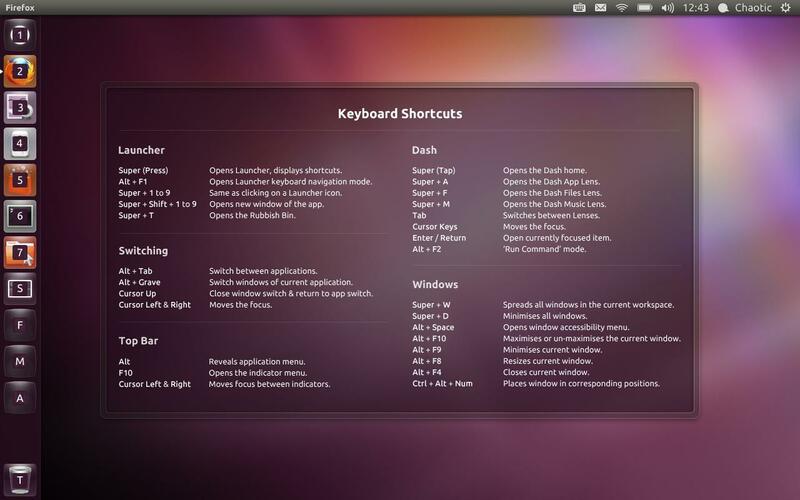 Alt + F1 - Put keyboard focus on the Launcher, use arrow keys to navigate, Enter launches an application, Right arrow exposes the quicklists if an application has them. 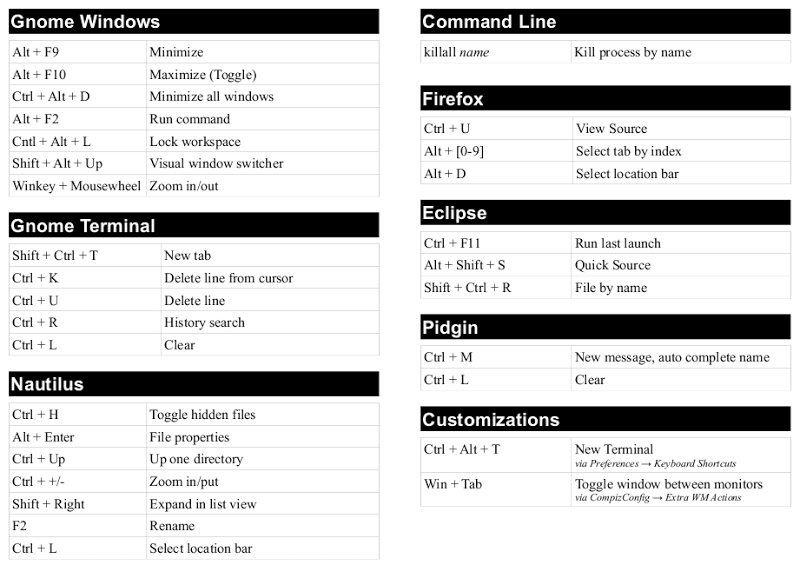 Ctrl + Alt + T - Launch a terminal window. Tap Super - Opens the Dash. The open signal is sent when you let go of the key, not when you push it down, so if it feels slow just let go of the key earlier. Over an item, you can hit the Secondary key (commonly to the left of the right Ctrl) to see a preview of the item, as you can do with a secondary click over it. Alt + F2 - Invoke the Dash in a "special mode" to run a command. Typing in a folder name will find that folder in Nautilus, you can also use ~ as a shortcut in the field. The Dash opens with focus on the search box to find applications and files. Using the arrow keys will navigate the results, use Enter to launch. Hitting Enter twice in rapid succession after a search term will automatically launch the first match in a search, even if it's still ongoing. (Basically a dash version of "I'm feeling lucky"). Ctrl + Super + D - Show desktop; hitting it again restores the windows. Super + W - Spread mode, zoom out on all windows in all workspaces, in 12.04 and 12.10 it zooms out on the windows in the current workspace. Super-D - Minimize all windows; hitting it again restores them. Alt + Space - Opens the window's accessibility menu. Alt + Tab - Switch to other applications, you can hold Alt down and then hit tab to switch to the next application. Ctrl-Alt + Numpad 7 - Place window in top left corner of screen. Ctrl-Alt + Numpad 8 - Place window in top half of screen. Ctrl-Alt + Numpad 9 - Place window in top right corner of screen. Ctrl-Alt + Numpad 1 - Place window in the bottom left corner of the screen. Ctrl-Alt + Numpad 2 - Place window in the bottom half of the screen. Ctrl-Alt + Numpad 3 - Place window in the bottom right corner of the screen. 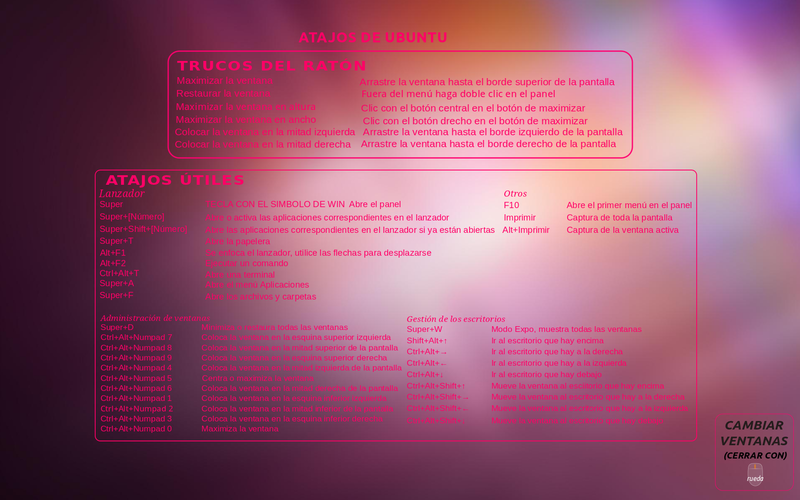 Ctrl-Alt + Numpad 0 - Minimize the current window (Ubuntu 12.04.1). Super + S - Expo mode (for everything), zooms out on all the workspaces and lets you manage windows. Shift + Alt + ↑ - Expo mode for all windows in the current workspace only. Ctrl + Alt + ← / → / ↑ / ↓ - (11.10+) - Change to a new workspace. Ctrl + Alt + Shift + ← / → / ↑ / ↓ - Place window to a new workspace. Ctrl + Alt + L - Lock the screen. Maximizing - Dragging a window to the top panel, or double-clicking a window's titlebar, or Alt + F10 (11.10 and earlier), will maximize it. Middle click on Maximize - Maximize window vertically. Tiling - Dragging a window to the left/right border will auto tile it to that side of the screen. Middle click on an application's launcher icon - Open a new instance of the application in a new window. If the application isn't running it will just open it normally. Middle click on the top panel or window title bar (but not the menu) - send the current window behind all other windows. I've made a Unity tricks overlay for the 11.04 default wallpaper. Click on the image for a full screen version. If you find a mistake just tell me. Here is the JPEG source version. There is a feature in development for 12.04 so that when you long-press the Super key, a detailed overlay of possible shortcuts will appear. Also notice the numbers appearing besides the application icons in the launcher dock on the left. Super + Number is a short cut to that specific app, to save you from Alt + Tab madness when rapidly switching between three or more apps (such as while programming). As per demand an English version of that wallpaper. If you find a mistake please inform me! 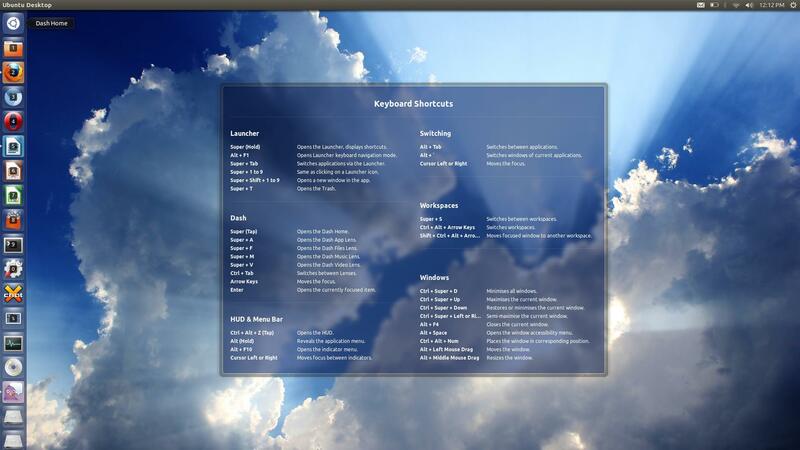 If you hold down the 'Windows' key (Called 'Super' in the Linux world) you will get an overlay on your desktop, containing the most common shortcuts. Ctrl + Alt + Arrow Key : changes workspace. And Alt + D both work. An equivalent to run would be Super and holding Super will focus the launcher. 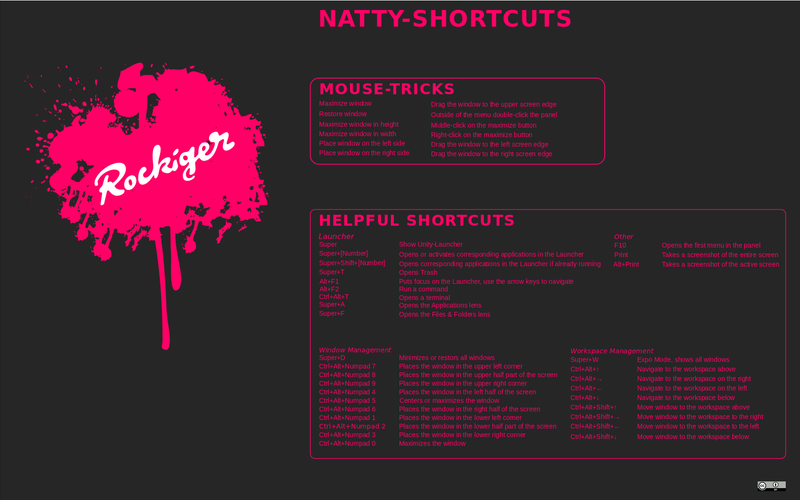 I made a printable version of the shortcuts and mouse tricks. You can grab the ODT here or the PDF here. Alt + F7 with arrow keys to move the current window on the screen. Use arrow keys to change its position fast, and use arrow keys (on number key area when NumLock is off) to change it slowly. Alt + F10 to resize current window between normal size and max size. I translate into Spanish the printable version of the shortcuts and mouse tricks. You can grab the ODT here or the PDF here. Please inform me if the links are broken or the translation is bad. Not the answer you're looking for? Browse other questions tagged unity shortcut-keys or ask your own question. How do I display two windows as split screen? What is the shortcut to lock computer? Is there a shortcut key for accessing the menu bar? How to navigate and launch installed applications? How to move windows around and between screens? how does one get to terminal mode in later versions of ubuntu? Reassign keyboard shortcuts for Unity “launcher”? Are there any Keyboard Shortcuts to Shutdown? Are there keyboard shortcuts for opening/using the filter on the unity dash?